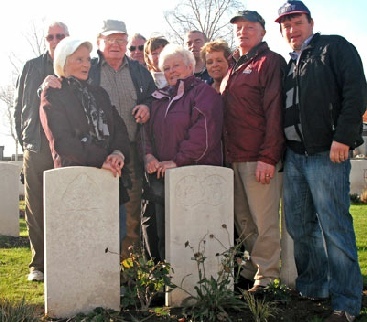 Last November members of the Fields family from Emyvale went to Ypres, Belgium to visit the grave of a long lost relative who died in World War 1. His name was John William Fields, the rank of drummer with the Royal Dublin Fusiliers. He was born in the town land of Mullaloughan, Donagh and was the son of Patrick and Teresa (Clerkin) Fields. The family knew very little of John until a couple of years ago when a relative in Dublin watched a programme on RTE about the forgotten Irish solders who fought in the great wars and it was from this, that Victor Fields searched the commonwealth war graves and found John’s inscription and the location of his grave. He is remembered with honour in Mendinghem Military Cemetery outside Ypres Belgium. John was only 22 years and married just a couple of months when he was wounded preparing for the third battle of Ypres. He died on the 19th of July 1917. 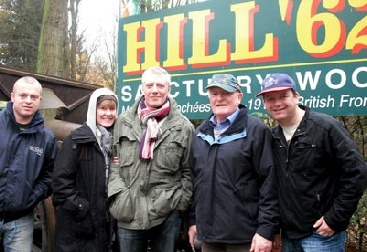 The Fields family members who visited his grave included: Oliver & Kathleen Fields, Anna McKenna(Fields), Joseph Fields, Patrick Fields, Victor Fields, John&Sheila(Fields)McEneaney, Philip & Lisa McEneaney. 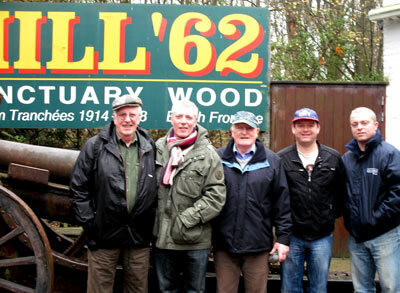 They also visited battles fields and war museums depicting the horrors of battle and the experiences of war. They also attended the ceremony of the “Last Post” which takes place every night at 8pm at Menin Gate, leper (Ypers) Memorial to the Missing who fought in World War1. Joseph Fields forwarded details of John William Fields to St. Macartan’s College to add to their World War One research project and he wishes the College the very best success with it. In Flanders Fields John Fields was laid. In the mud and the blasts of the day. Will they kill or be killed in the action? Just depends on the luck of the day. For it’s all in the work of the day. Though it’s ninety years after his day. Supplied to us by Joseph Fields.